Infinity Pipe Systems Project Management is a fully integrated turnkey solution provider, boasting some of the best and most experienced minds in the Australian and New Zealand pneumatic industry. Implemented to provide our distribution network with a range of support services, from brief to build, our team of experts are equipped to help every step of the way. Our highly qualified business development consultants will recommend the best and most suitable pipeline products for the job. Additionally, our design team are available to provide advice on airline development, ensuring each system is energy and cost efficient. Infinity Project Management guarantees superior customer service for any job, no matter how big or small. Contact your Infinity representative today for an obligation free quote and consultation, or find out more about our services below. At Infinity, we are dedicated to providing our distributors with industry leading advice and solutions. Our experienced business development consultants can project manage any compressed air assembly from start to finish, with the goal to optimise a system design that will increase performance and reduce expenditure. We believe that Infinity provides only the best and most advanced pneumatic equipment on the Australian market, however if you need a customised product that fits an application perfectly, our Project Management consultants have the capability to modify our products to suit your requirements. The vast technical knowledge of our team ensures that they are able to offer you only the best advice when it comes to product selection and application. Our consultation team are available to help with any sized compressed air project, from a small modification to a full scale compressed air installation. We have access to a wide network of designers and support installers across Australia, ready to undertake any task. Whether you are in need of project management, technical information, design solutions, or just some advice, contact us today. A properly designed airline network can have a dramatic and direct impact on the performance of a compressed air system, sometimes generating significant savings in outgoing costs and downtime. As such, to ensure a compressed air network is operating efficiently, it is worthwhile to invest in the services of a professional design team. After years of being in the pneumatics business, we have the ability and expertise to design and build a system based on maximum optimisation. We work closely with our distributors to create a tailored plan that can reduce energy costs, decrease maintenance time and increase reliability, resulting in a system that meets current needs, as well as offering flexibility for future expansion. 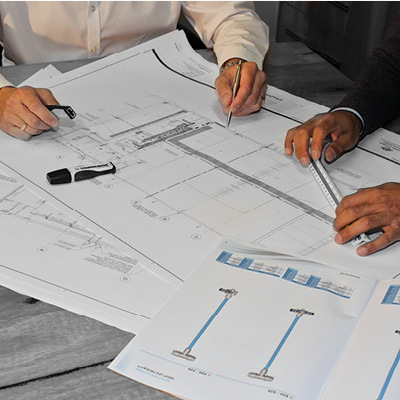 The Infinity Project Management designers work with each distributor to create a fully customised As-Built drawing, that is continually refined throughout the consultation and design process. Whether it be a simple pipeline or a fully integrated compressed air system, we have the cababilities and resources to generate an efficient design. Our qualified Infinity installers through our distribution network are a group of highly skilled and experienced technicians, who take pride in fitting systems that not only look good, but are efficient and productive. Available across Australia, our installation technicians’ work closely alongside our consultants and designers, in order to develop an airline system that is tailored specifically to each clients’ needs. After installation, our team are available to conduct regular maintenance and air quality checks, ensuring that your system remains leak free and the air stays clean. Contact our head office today to find your closest local installation agent. Our installers are located all throughout Australia and New Zealand through our distribution network. Infinity Project Management is fully committed to complying with national guidelines and safe work practices, and as such, we have ensured that we are fully certified for every job. With support documentation and proven competency, our staff are qualified to perform consultation, design, installation and maintenance support for any airline, Australia wide. If you would like more information on our accreditation and documentation, please contact us directly. Please sign me up for Infinity Newsletters!